What do I get as a premium user? According to scientific studies, a permanent training effect emerges when you exercise regularly about three times a week for 20 minutes. 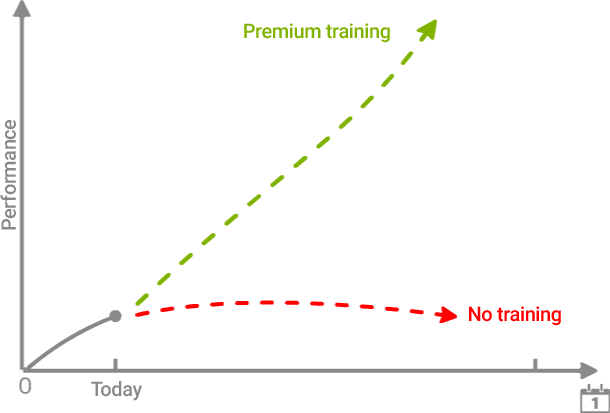 When will the premium training be activated? Your premium membership will be unlocked immediately after purchase. Access to Web and App will be available to you from this point onwards without restriction. You get access to many highly effective courses and more than 60 individual exercises. You can also make use of all exercises and training plans on the app. In our courses you will find a scientific compilation of specific exercises, which can be completed daily. Incredible improvements only after a few sessions of training. I am absolutely convinced. "I like really like NeuroNation and I like the fact that it was developed by neuroscientists, by people who understand something about it." Very cool. Getting smarter was never this much fun. Thanks.